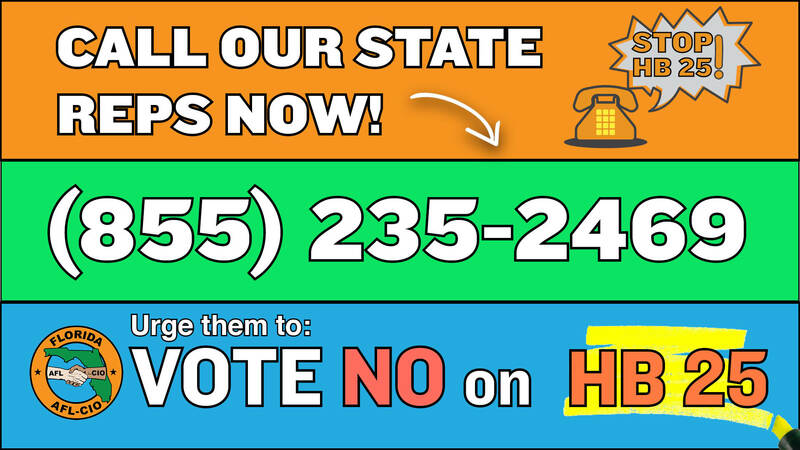 Tomorrow, Tuesday, December 5th, state representatives on the Government Accountability Committee will vote on HB 25, the union busting bill that would eliminate Florida public unions in a workplace if an arbitrary number of workers, set by the politicians, do not voluntarily pay dues. This is the same legislation that workers packed committee meetings against last session to voice their strong opposition. Now House leaders are trying to ram through this damaging bill AGAIN, with little to no public input. Legislation requiring the payment of union dues by over fifty-percent of a bargaining unit or the forced decertification of that union is unfair, unnecessary, and a waste of taxpayer dollars. It’s unlawful to force anyone to join a union, and Florida already has the processes in place for workers to remove a negotiating body from their workplace. Make no mistake, this bill is just an attempt by billionaire CEO backed politicians to make it harder for nurses, teachers, bus drivers and other public servants to come together to advocate for their on the job needs and negotiate to protect their paychecks. Call (855) 235-2469 to be connected with a state representative on the Government Accountability Committee. Leave them with the message that you reject this clear assault on workers’ rights and urge them to vote NO on HB 25. Say NO to massive tax breaks for the wealthy.